Jump in, the water’s fine when you’re with Charles Soule and Ryan Browne’s CURSE WORDS SUMMER SWIMSUIT SPECIAL #1—a sizzling one-shot set to make a splash from Image Comics this August and featuring interiors by guest artist Joe Quinones. PORTLAND, OR, 5/24/2018 — Jump in, the water’s fine when you’re with Charles Soule and Ryan Browne’s CURSE WORDS SUMMER SWIMSUIT SPECIAL #1—a sizzling one-shot set to make a splash from Image Comics this August and featuring interiors by guest artist Joe Quinones. SEE: Sizzajee’s sinister sorcerers sweating their way through the sunny, sultry summertime season back in the Hole World. SEE: a hogtaur in a Speedo! SEE: an invisible wizard with a sunburn! SEE: such sights! Such glorious sights! JOIN US. 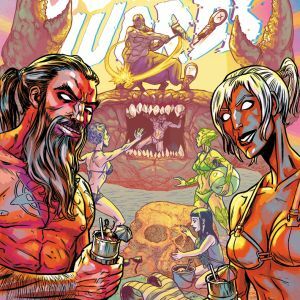 Soule said of the one-shot’s origins: "The Summer Swimsuit Special was born out of my desire to see one simple question answered, one that's been ringing through my mind since I was a very young child: what would happen if a bunch of weird wizard jerks went to the beach? Now, at last, thanks to the wonderful art of guest artist Joe Quinones and the forbearance of Ryan Browne, we'll all find out together. This issue is a one-shot story designed to answer lingering questions about some of the main cast of the book, and it has lots of great drama and exciting action—but mostly, yeah, it's a chance to see a bunch of sunburned sorcerors. It also has my very favorite pun in the series so far, a verbal gag so convoluted that I had to burn like two pages of the issue to set it up. WORTH IT. See you at the seaside, friends!" 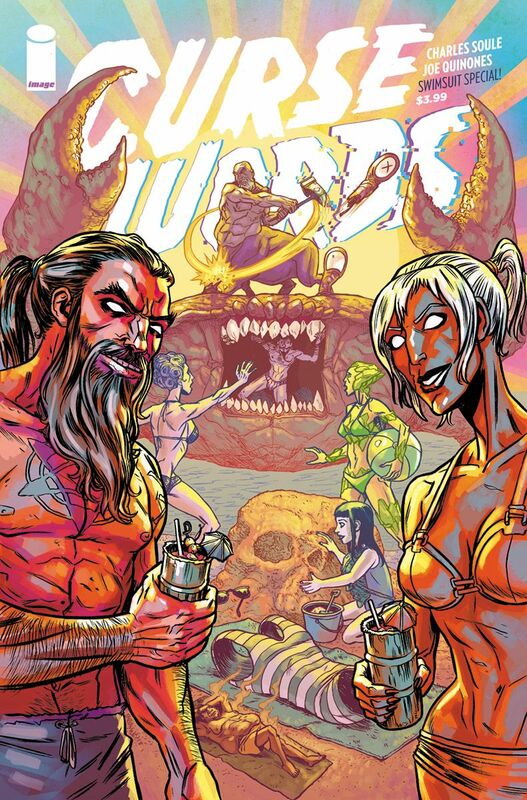 CURSE WORDS SUMMER SWIMSUIT SPECIAL #1 one-shot Cover A by Browne (Diamond Code JUN180050) and Cover B by Quinones (Diamond Code JUN180051) hit stores on Wednesday, August 22nd. The final order cutoff deadline for comics retailers is Monday, July 30th.